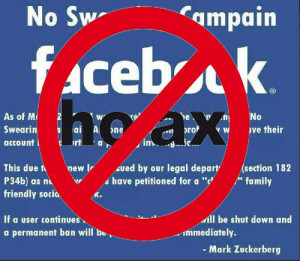 Circulating message purporting to be from Mark Zuckerberg claims that Facebook is set to launch a ‘no swearing campain’ and that people subsequently caught using profanity on the network will have their accounts locked pending further investigations. The message is just a hoax: Facebook has made no announcement nor sent any messages about launching an anti-profanity campaign like the one described here. Facebook users have access to profanity filters that will block posts containing certain offensive words, and Facebook’s Community Standards and Statement of Rights and Responsibilities sets down some guidelines about posts that might be considered hate speech, bullying, or harassment, but Facebook has no (and is not implementing any) general overall ban on swearing.